This book was written to accompany an exhibition of 60 Delaware samplers at the Biggs Museum of American Art in Dover, DE held March 7 – April 20, 2014. Focus of the exhibition and the catalog is on the various ways in which Delaware samplers include genealogical information about family, friends, and teachers. Introductory material includes a Foreword by Dr. Susan P. Schoelwer, an introduction to Delaware’s early decorative arts by curator Ryan Grover, and an overview on “genres of genealogical samplers” by Drs. Lynne Anderson and Gloria Allen. The remaining six sections, arranged more or less chronologically, focus on specific schools or features within Delaware’s sampler making history, with each section including an introduction, along with information and images for eight to fourteen samplers. 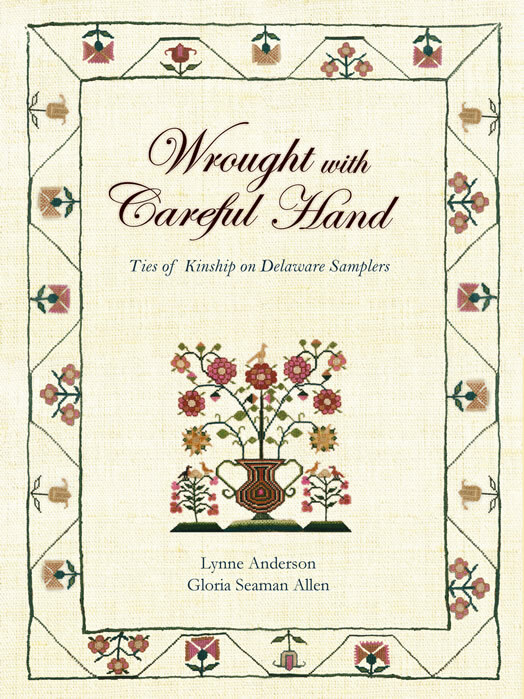 Each sampler is extensively researched to include information about family history and links to Delaware’s social, political, and economic history. Section titles include: (a) The Philadelphia Influence: Eighteenth-Century Band Sampler Traditions (1755-1814); (b) Quakers at Duck Creek: Southern Boarding School Samplers (1800-1806); (c) Chester County Connections: The Harvey Sisters (1804-1813); (d) Needlework Instruction in Lewes: Mrs. Bowers and Her Predecessors (1806-1823); (e) Private Heirloom to Public Document: Family Record Samplers Hold Genealogical Secrets (1798-1833); and (f) Tracing Initials to Names: Family, Friends, and Teachers (1786-1845).